What is DuoDerm and why is It Used to Treat Bed Sores? DuoDerm is the brand name for a commonly used hydrocolloid dressing manufactured by ConvaTec that is used to treat bed sores (or similarly referred to as: pressure sores, pressure ulcers or decubitus ulcers). Hydrocolloid dressings have gel-like properties to absorb excretions from the wound and protect the wound debris and potentially infection causing bacteria. 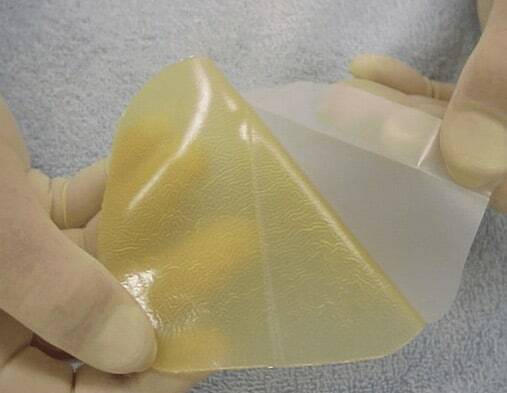 Hydrocolloid dressings dressings help the wound to autolytically debride itself (the body uses its own enzymes to break down dead tissue as opposed to surgically removing it). DuoDerm dressings are impermeable to water vapor, oxygen and bacteria. One of the reasons DuoDerm dressings are so popular is because they will not stick to the wound bed itself and can be removed without tearing the granulation tissue underneath. They are best applied to wounds that produce light to medium exudate or transudate (extravascular fluid with low protein content, a low specific gravity and low nucleated cell counts). 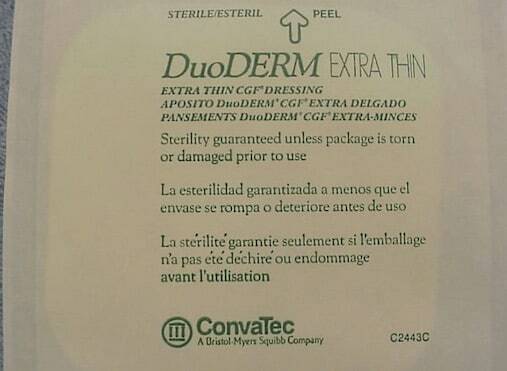 Depending on physician orders, DuoDerm dressings can be used on stage 1, 2, 3 and 4 bed sores. The length of time a DuoDerm patch may be left on a wound is determined by the amount of moisture in the wound. Under normal conditions, DuoDerm can be left on the wound for 3-4 days. One of the advantages to using DuoDerm is that, unlike other dressings, it can be placed on wet wounds and wet surrounding skin and will remain in place due to the product’s ‘wet tact’. Because DuoDerm essentially creates a moisture barrier, they should not be used on people with infected bed sores. Under normal circumstances, wounds covered with DuoDerm are likely to develop a strong odor after several days. The odor is consider to be a normal part of of the product. Can young people develop bed sores during an admission to a medical facility?